Before you read this article, please check out the videos of Bob-E, the VR Remote Presence Robot. Developing a quality product is hard even if a qreat team is working on it. Problems that are difficult to solve come up, especially if such a technologically advanced product is built as Bob-E. Our team was not exempt from such issues. 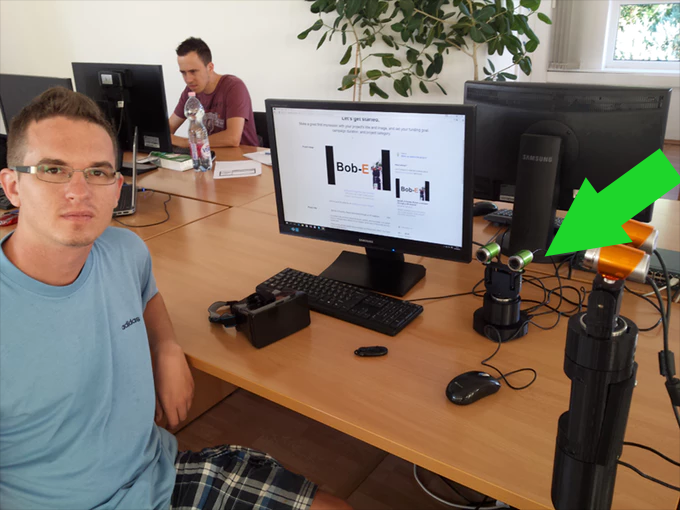 At one point, during a very hot summer evening, after long hours of work, one of our developers, Tom, was so tired and got so frustrated about a technical problem, that he said he will use his "Jedi power" and disassamble Bob-E into small peaces and will take Bob-E's head home. Although he is one of the most brilliant developers we have ever met, he did not have any "Jedi power" (luckily), and could not do any harm to the Robot. A few days later another colleague, David suggested, that maybe it is not such a bad idea. Since one of the most amazing features of Bob-E is head tracking and 3D vision, it might make sense to use Bob-E's head in itself, and to create a smaller, more compact product that can be used as an intelligent robot camera. We decided to call Bob-E's head "Bob-E Mini" and we offer it as another product. 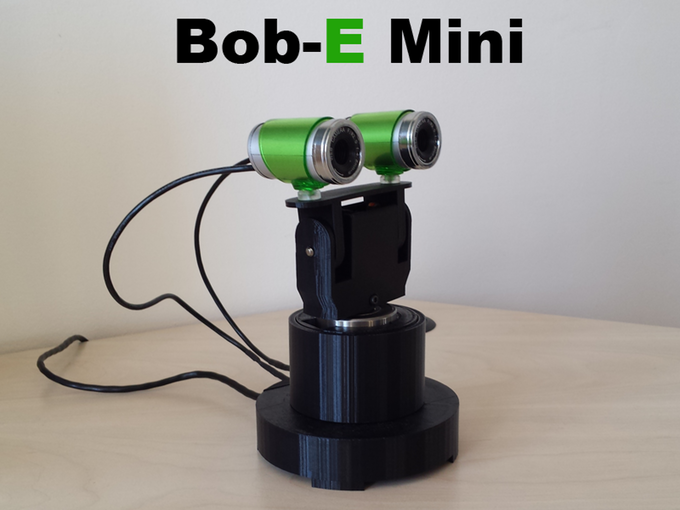 Bob-E Mini is a super fast 3D robot camera, it provides the same 3D vision and head tracking capabilities and the same performance you can get from Bob-E. However it is at a fraction of the cost. On the other hand it has the same motherboard, the same CPU, RAM, Wifi and remote control capability and of course it also uses Bob-E OS. Bob-E Mini provides all the software and hardware interfaces needed for developers. Although it is designed to be used as a standalon 3D robot camera, it can also be used in your own robotics project. 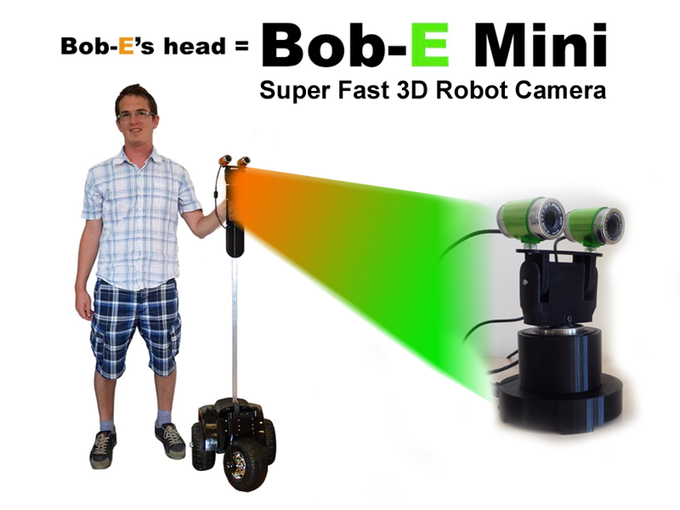 Bob-E Mini uses the same technology to move it's head that is used in the stanard Bob-E Robot. 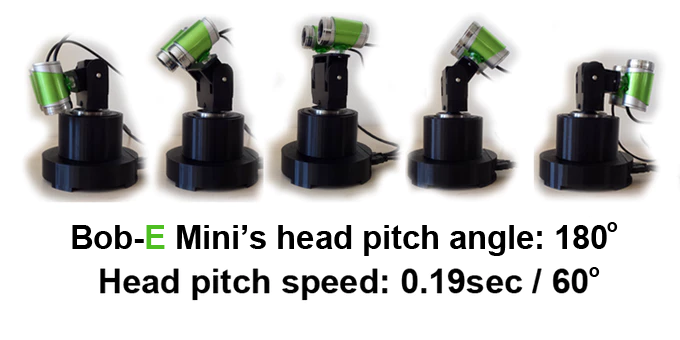 It can track human head movement at a speed of 0.19 second per 60 degrees, and can move around in an angle of 180 degrees both horizontally and vertically (two degrees of freedom). It's cameras are exactly 65mm apart, just like the human eyes, to give a truly awsome 3D experience to it's user. The resolution of turning for both vertical and horizontal movements are 0.17 degrees. This make the camera very precise. You can use Bob-E Mini to look up, look down and look sideways. The camera will quickly track every little movement of your head. It is way faster then any PTZ camera you would normally find to buy and it provides a much wider angle of view then you can normally get. We encourage you to order Bob-E Mini and experience the freedom of remote presence. We have put together a package that helps you get started. 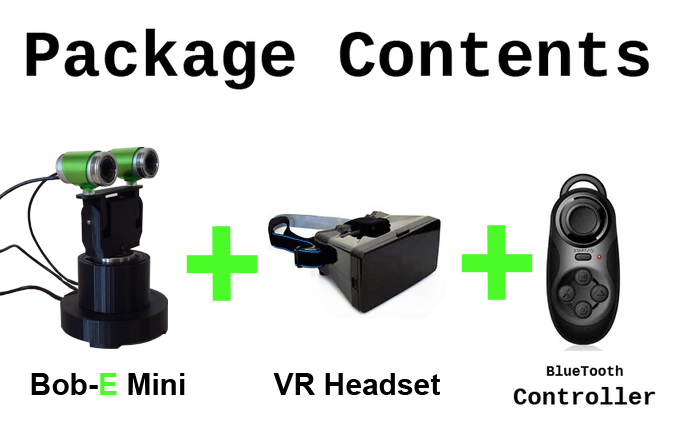 We have included the Bob-E Mini super fast 3D robot camera, a VR headset and a bluetooth controller in the package. Note that we do not provide a smartphone with this package. 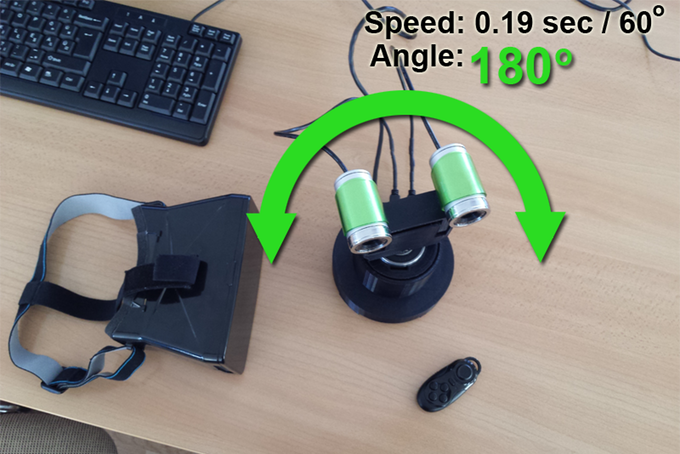 You can use your Iphone or any Android phone with a gyroscope.